Located at 410 Mill Street, Job Market Maker joins a growing number of technology companies seeking the convenience, amenities and business-friendly environment found in the town. For the celebration, Mayor Pro Tempore Gary Santos was joined by Councilmen Elton Carrier and Jim Owens, Mount Pleasant Business Association President Chris Staubes, senior town staff, and regional business leaders. "We are thrilled Job Market Maker 'came on over' to Mount Pleasant," said Mayor Linda Page. "This demonstrates that our focus on creating a robust entrepreneur ecosystem and attention to placemaking is paying off. Job Market Maker is creating disruption in one of the oldest industries around, and through that innovation, will continue to see growth in their company, growth that will also benefit our Town." 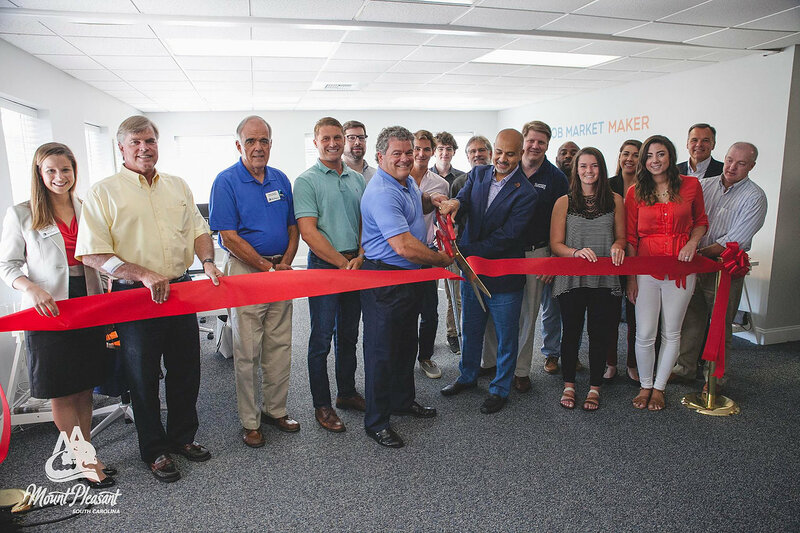 Founded in 2013, Job Market Maker has been named a Top Ten Startup to watch by the Charleston Regional Business Journal and the only South Carolina-based company to be named a Gartner Cool Vendor, 2016. "Job Market Maker is thrilled to call Shem Creek home," said CEO Joseph Hanna. "With our rapid growth projections, it was important to find a headquarters in which we could expand, while also providing the necessary business environment. This was the ideal fit; here, we can walk clients to lunch or paddleboard along the creek for team-building after work." Job Market Maker's portfolio of products allows clients to find, assess and select top talent. The company launched their initial product JMM, a complete pre-hire solution, in 2015 and their subsequent product ENGAGE this past May. ENGAGE, a passive candidate recruiting solution, has taken the industry by storm in the short period since its launch. Local clients include Roper St. Francis, Southeastern Spine Institute, Trident United Way and the South Carolina Aquarium. The Town of Mount Pleasant's Economic Development mission is to advance the Town's quality of life by fostering an economic environment that is vibrant, favorable to job creation, and promotes the general prosperity of the community. For more information on the Town of Mount Pleasant, visit us online at www.tompsc.com, view our videos on the Media Channel, subscribe to our news with Notify Me, like us on Facebook, follow us @MtPleasantBiz and download our Apps "Experience Mount Pleasant" and "ConnectMP."